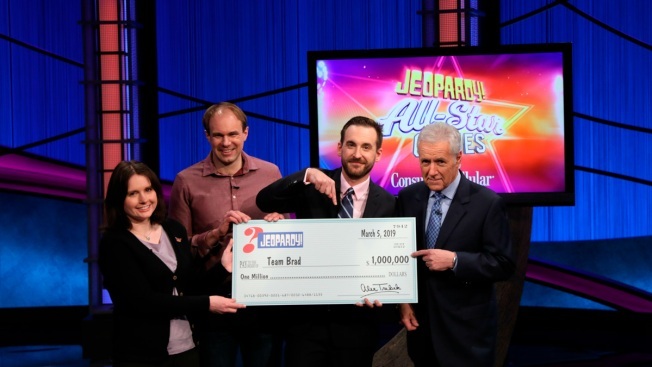 This photo provided by Sony shows Brad Rutter, Larissa Kelly and David Madden with Alex Trebek, winners of the first-ever "Jeopardy!" team championship, Tuesday, March 5, 2019 in in Burbank, Calif. The first-ever "Jeopardy!" team championship came down to a clash of the titans, Ken Jennings vs. Brad Rutter. With $1 million at stake, a big Daily Double bet by Rutter positioned his team for a runaway victory as the quiz show's "All-Star Games" ended Tuesday. Rutter and teammates Larissa Kelly and David Madden split the top prize, with Jennings, Matt Jackson and Monica Thieu sharing $300,000. Colby Burnett, Pam Mueller and Alan Lin took third place and $100,000 on the show hosted by Alex Trebek. Rutter entered the contest as the top winner on any game show with a haul of $4.3 million in regular and tournament "Jeopardy!" play. Jennings was a 74-game winner and top moneymaker in the quiz show's non-tournament competition with $2.5 million. "To see it come down to the two heavyweights was the perfect culmination of it," Madden said in an interview. "It certainly did not disappoint in terms of the quality of play, and we just got lucky that Brad pulled the Daily Doubles when needed and had a great round." "Ken played great, too, as did Team Colby," he said, graciously. For his part, team captain Rutter was happy to share the credit with Madden and Kelly. "The money is great, but these champs aren't here for the money. They're here for the glory," he said. "I wanted to bring it home for my team, because they worked so hard and prepared so well and played so well." "Brad and I have probably played against each other more than any two other people in 'Jeopardy!' history, but it's never enough for me," Jennings said in a statement. "On the one hand, I'm thinking, 'Just once, can somebody take this guy out in the semis?' But on the other hand, you want to see how you stack up against the best talent available." Kelly called Rutter's performance "incredible to watch." It also made easy work for her in the final round of "Jeopardy!" as she faced a question about Constitutional amendments. "I was assuming I would have to get it right, and it turned out it didn't matter at all. I was totally in a no-pressure situation," she said, happily. The winning teammates boast longtime friendships. Madden and Kelly were quiz-bowl teammates at Princeton, and Rutter and Madden met at a tournament in 2006. Playing as a trio was an "amazing aspect of the whole experience," Madden said. So how will each spend their share of the prize, about $330,000? Madden said he and his wife will plow some of it into International Academic Competitions, the company they founded that organizes quiz tournaments for schoolchildren worldwide. The investment may eventually allow them to reduce their time on the road building the business and move to a new home, he said. Kelly and her husband, both with the National Academic Quiz Tournaments company, have travel in mind, as well as updating the house purchased with her earlier "Jeopardy!" winnings and doing what Kelly called the "prudent" thing by saving for retirement. As for Rutter, an Australian vacation is likely. And he'll continue to pursue work as an actor in TV commercials and pitch ideas to produce, including a game show and sitcoms. "So a little bit more for the nest egg, and I can support myself without having to wait tables like everyone else in Hollywood," he said.